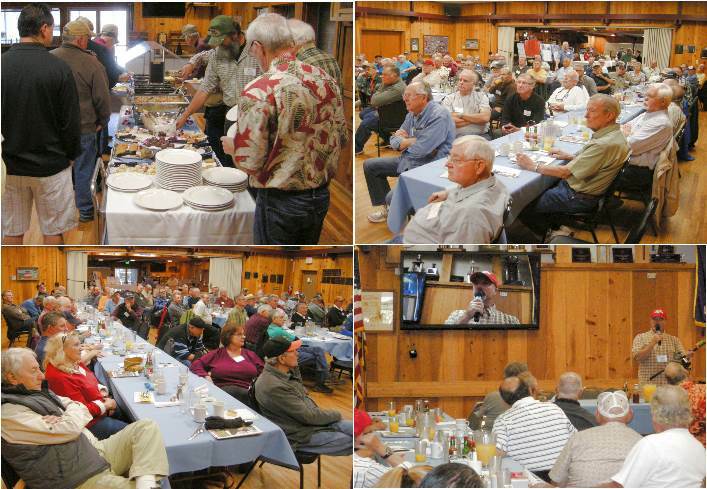 Rooster Tail Fishing Club Members, non-member guests, and general public are invited to attend the club’s monthly breakfast meeting held the third Friday of each month except for the Member’s Annual Holiday Brunch & Awards Ceremony in December. Men and Women 18 year’s old or older, couples, and retirees interested in fishing and fishing related subjects are invited to attend our breakfast meetings. Doors to the Auburn Elks Lodge open to breakfast attendees at 7:00 a.m. Admission is free and reservations are not required, attire is casual, free coffee and a friendly environment awaits you. The $15 wide selection breakfast buffet is open between 8:00-9:00 a.m. The self-service buffet includes multiple choices of egg dishes, breakfast meats, biscuits & gravy, potatoes, fresh baked pastries, seasonal fruit, and free orange juice. It is a great time to share a nice meal and a fishing story or two with fellow anglers. We usually have upwards of hundred attendees at our typical breakfast meeting. Although we meet at the Auburn Elks Lodge, 195 Pine Street, Auburn, CA 95603, there is no affiliation with the Elks other than use of their facility. The Lodge is well maintained, air-conditioned, with modern clean restrooms for men and women. There is free spacious parking and includes special parking for individuals requiring assistance. The Lodge dining room is set-up with comfortable open seating, linen covered tables with home-style utensils cups, glasses, and plates for an enjoyable meal. As part of the breakfast program, at 9:00 a.m., an expert guest speaker makes a half-hour fishing related presentation including time to answer questions from the attendees. 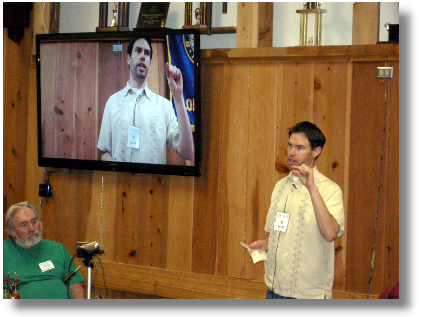 The Lodge is equipped with a state-of-arts audio/visual system with live streaming video onto a large six-foot flat-screen television to allow clear viewing throughout the room. Breakfast attendees are welcome to participate in a fun raffle for cash prizes, tackle, wine and other items. In the adjoining room, tables are set-up for free literature and frequently free fishing related samples. The Rooster Tails are hoping you will join us for a fun next third Friday breakfast meeting and even consider becoming a club member. Owning a boat is not required to become a member. Unlike other fishing organizations and businesses that provide fishing-advise from a select group of repeat ‘advisors’, the Rooster Tails Fishing Club provides a wide spectrum of fishing experts with a variety of fishing specialties for unique presentations at our breakfast meetings. We strive to provide our members and guests with the newest insight for tackle, techniques, strategies, and advice for specific fish species with minimal repetition of previous provided information.